from their new Cannery Square plaza. The City of Sherwood (about 17 miles southwest of Portland) is holding a public hearing during their City Council meeting tonight on a new ordinance that would ban “wheeled activities” — including bicycles — near public spaces. 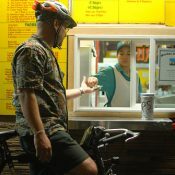 A reader tipped us off to this issue via coverage on OregonLive.com. City Staff has identified a need to protect significant public investments in the City of Sherwood from damage resulting from improper use and to protect the City of Sherwood from liability that may arise from improper use. 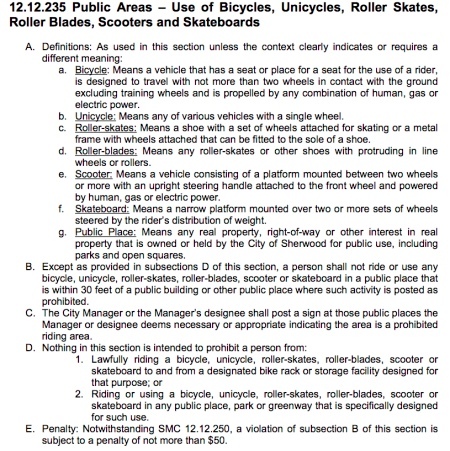 The new code (see it below) would specifically prohibit the use of “bicycles, unicycles, roller-skates, roller-blades, scooters and skateboards” within 30 feet of “public spaces.” The new ordinance defines “public spaces” as any property that is “owned or held by the City of Sherwood for public use, including parks and open squares.” Failure to comply would result in a $50 citation. As someone who grew up in Orange County, California, I’m well aware of skateboard bans due to the damage they cause to structures; but adding bicycles into that mix is less common. Our Washington County reporter Will Vanlue will try and attend the meeting tonight to learn more about the issue. Stay tuned for a follow-up. If you live in or around Sherwood, consider showing up to the hearing at City Council tonight at 7:00 pm in City Hall (22560 Pine Street). One of the only reasons I got to Sherwood is to sip coffee (mid-ride) at Black Bird on SW Railroad. This is right next to one of these ‘public spaces’. Imagine a public space.. for everyone. Exactly the reason I should be able to slowly and carefully ride my motorcycle or scooter through there! motorized forms of transportation create noise and air quality issues wherever they go. A “motorized transportation” ban would be perfectly reasonable. I wonder how the Unicycle Bastards feel about this. When was the last time you saw a unicycle do damage to structures. Still. I’m not so worried about them banning wheeled activities from any space that doesn’t also allow for cars. If cars are allowed, so are the bikes. End of story. To ask for someone to walk their bike through a square is not such a heinous request. But to ban bikes from “all public spaces” seems to have some bad conflicts and precedents built in. Note that their definition of bicycle excludes all trikes and tadpoles. Have at it 3-wheelers! Since the roads in front of of those public places are also not designed specifically for bikes but are ostensibly owned by the city of Sherwood, I suppose the law forbids riding on Sherwood’s roads as well. I guess somebody could lock up a bike at a rack on the sidewalk but I have to idea how they will have gotten that far without receiving a summons for some prior infraction. Too bad. Why do people go to Sherwood in the first place? Is it near Blackhawk Colorado? Catch me going to Sherwood or spending dollars in their town with silliness like this. Clearly, protecting public spaces from unnecessary damage is warranted, but this sounds like an official who either fundamentally doesn’t understand the concern, knows something about bicycle-initiated damage that we do not, or has a grudge. As far as I can tell this also prohibits Personal Mobility Devices like a Hoveround or similar electric wheelchairs. I haven’t seen anything as dangerous on the sidewalk as the woman? (too obese to tell) on a Hoveround-like device booking down the SW Millikan way bike lane and sidewalk at speeds of at least 15MPH. I have to conservatively estimate her weight at least above 350 pounds. 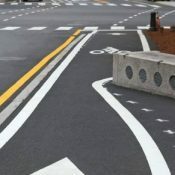 Would someone like to explain to me why that is safe and a cyclist is not? I understand the need for unilateral simple rules that are easy to understand, especially for the most moronic of police that need dirt simple laws so they know who to arrest. But laws are designed to protect. To protect sometimes we must exclude but if we are going to waste our time and money arguing over a law and then waste time and money administering that law it should actually protect from the dangerous behavior, not simply exclude only the hazards that myopic politicians can envision. by human, gas or electric power. Evidence that they’d rather attack a device than the behavior. Seems like a blanket law, primarily aimed at skaters and BMX riders, to protect public spaces and parks from damage. Covers the main offenders but also dissuades others from turning public greenspaces into private cyclocross practice courses, underground Segway drag racing strips, impromptu MTB trials sites, etc. No anti-bike conspiracy afoot and you can still ride the roads in and around Sherwood. who wants to ride through it anyway? what would be the point? Anyone not living in Sherwood really doesn’t have much of a say in their city business. But of course the law will be implemented carefully! And ever officer of the law will dutifully make the important distinction between bmx versus skateboard versus holy commuter and will leave the commuter in peace while taking it to the miscreant bmx’ers who should get some sort of janitorial position because they aren’t doing well enough it school. This crazy law can be beat but people have to show up in Sherwood and that is the tricky part. I’m hoping Vanlue can come back from the meeting with some good information about what specific kinds of issues with skateboards, bikes…and the other things with wheels named in Sherwood’s proposed law, that the city hopes the law will effectively deal with. People have also been using certain types of bikes…bmx and off-road bikes…for jumping,sliding and grinding on low walls, benches, steps, planters. Skates have been used this way as well. Downtown Portland has a lot of damage from this kind of use. It’s this kind of damage Sherwood’s probably hoping to avoid. Maybe the city can write up its law a little better, making clear that it’s not seeking to eliminate the benefits of the use of bikes, skateboards, skates, etc. in the city, but only the destructive uses. I’ve been asked to walk my bike through Pioneer Courthouse Square, and I did. It’s a reasonable request to have that in a public square. Parks however? That’s a whole different question. Pioneer Courthouse Square falls under a downtown sidewalk area. Illegal to ride on it per state law and local definition of “downtown area”. I’d always thought that law was just at the city level. It’s at from the state also? Perhaps it is better to consider this space as a “slow place” or “slow space” and it also helps to be logical: A walking parent matches the speed of their small child on a scoot bike, so the latter should be allowed. 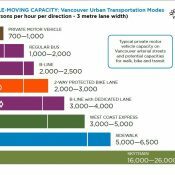 So it can be a “(normal) walking speed space” and this could also mean someone could ride a three-wheeled cargo bike very slow through it…. Maybe shoot for all of this as a compromise? 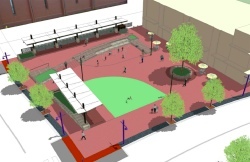 been saying this forever, but any architect that designs a plaza with ledges, “hubba” rails, planters, and stairs that are even remotely skate-able should not be given the business by a city that wants to keep skaters out. city planners: please hire me for a nominal fee ($$$) and i will tell you if there are any desireable obstacles in your city plaza designs before you run with it. also, might want to delete the biker from the concept drawing at this point? Wait, Sherwood has a downtown? I attended the city council meeting tonight and it was clear that the intent of the ordinance was to discourage abuse and misuse of the features of the public spaces. The council noted that they needed to be supportive of active transportation, especially in light of the upcoming investment in Tonquin trail system. The ordinance passed with an amendment to include roadways as an exception in section D.
Well, I suppose if you’re commuting past the “public space” in the center of the road’s travel lane, you should be at least 30′, maybe more, from the “public space”. The road and shoulders is called a “right of way”, not a “public space”. Perhaps this technicality makes the ordinance moot so long as you are in the road.